At the end of last year, many industry experts predicted 2017 would be a tricky year for search advertising. For the most part, I believe this has turned out to be true. The biggest contributing factor in my opinion is the continued increases to overall average CPC (cost per click), meaning heavier optimisation is required to keep accounts running efficiently and on target. iProspect reported a year-on-year CPC increase of 26% for desktop and 40% for mobile in Q1 of 2017, showing steady progression following the holiday season. This has been a hot topic of debate, particularly on industry blogs and during conferences we’ve been fortunate enough to attend this year. The most thoroughly discussed solution to this is to move away from simply getting ads to the best position they can be on the SERP (search engine result pages), and moving towards positioning ads in front of the right audiences to reduce irrelevant clicks and wasted spend. Luckily, Google has also increased the amount of ways to do this within AdWords, allowing for more control and segmentation over which types of users are given the best exposure to an ad. 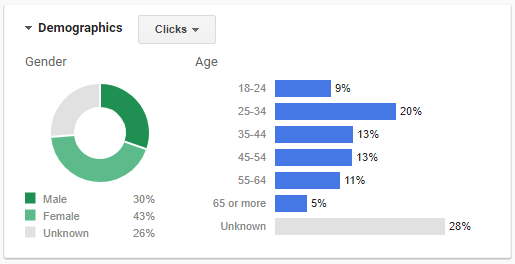 On top of the more widely used bid modifier-based targeting methods (such as location, device and ad scheduling) and modifiers set against your remarketing audiences, greater focus is now being put on demographic types. You may be familiar with age and gender targeting, but within the new AdWords interface you can target by parental status (previously available on the Display Network) and household income – although these new features do not appear to be fully functional just yet. As well as this, since May this year, you can now use the Similar Audiences feature within the Search Network. That means you can set a bid modifier against those who have not yet visited your site, but are exhibiting similar behaviours and signals to those who fall into your current remarketing audiences. When you think about it, we’ve come a long way since the bread-and-butter keyword bid-tweaking methods of optimisation. With all these features at our disposal, we should be well equipped to get ads right in front of those with high intent to convert – in theory. How you approach these targeting options will no doubt vary depending on what you are trying to sell and the purpose of the campaigns you’re running. You may have a safe assumption on who your target market is – you may even have solid intel on the persona types that make up your profitable user base. You may, of course, have no indication at all, which is entirely understandable for certain types of products or services. Let’s take something purely hypothetical. Imagine the product you’re selling is made solely for those working in an insurance call centre. Bournemouth is home to a variety of large insurance companies, so it’s likely that a friend – or a friend of a friend – has been part of the industry at one point in their career. As they will tell you, people of many different backgrounds, ages and interests make up the workforce, so in this example it would be very difficult to predict those likely to make a purchase of your product based on assumption. The solution may be simpler than you think, however. Here’s where you need to shelve your pre-conceptions and observe purely what the data is showing. Finding out why men between 18 – 24 years old reportedly have the highest conversion rate on your antique furniture sales website should be secondary to harnessing their potential to drive more sales. Optimise first and ask questions later, particularly if an audience type provides consistent benefit. Proving this through increased sales via your paid search marketing may well inform and influence any social or offline marketing to come. The key here is to not waste time pondering when revenue can be generated, regardless of understanding the motive. In performing persona analysis for clients here at Redweb, we often make surprising discoveries – certainly where seasonality is concerned. Ticket sales for a musical aimed at women may well have an easily realised target audience, that is until the holiday season approaches, where husbands, boyfriends, brothers and flatmates may have a sudden interest in purchasing on their behalf as a gift. Setting your modifiers on the assumption that your best converting audiences do not fluctuate throughout the year could mean missing out on important sales. Let’s say that women aged between 25 – 34, located 10 miles from their nearest store are your biggest source of traffic, and within that segment those browsing your website in their working lunch hours are the most likely to convert on your site. Wanting to maximise the visibility of your ads for these users during this time, you create a +50% modifier against these properties separately. What you’ve not considered here is that bid modifiers stack, meaning the four detailed above would effectively create a 4x 50% (or 200%) increase on your original CPC bid. A bid of £10 would become £30, which could have a noticeably negative effect on spend and CPA (cost per acquisition). What’s more, at present you cannot create modifiers against combinations of demographic details, meaning that your 50% modifier against those aged 25 – 34 will also include the men and the unknowns as well, which inversely could provide a source of high clicks but little return. The key here is to start subtle – try using modifiers of 5-10% initially and measure the results, gradually increasing those in areas of success. Confusingly, Google has renamed the long-established ‘Target & Bid’ and ‘Bid Only’ targeting methods to ‘Targeting’ and ‘Observations’ respectively. You will need to ensure that the ‘Flexible reach’ settings for each demographic type are set to ‘Observations’ (at campaign or ad group level, depending on where your modifiers are being made). If you don’t, you’ll find that any demographic groups not specified are effectively excluded from seeing your ads, which will throttle your overall traffic and spend. As mentioned earlier, factors such as seasonality or even more long-term shifts can mean that audiences known for consistently converting can change behaviour; intent can drop whilst new audiences start to perform. By regularly monitoring, measuring and amending your bid modifier setup, you can ensure you’ll stay hot on the heels of your best customers – and one step ahead of your main competitors. Whether you’re a fan or not, running an efficient PPC account has become more complicated and time consuming. The key to success is to adapt – and now is certainly the time to shift your perspective when it comes to ad positioning and targeting. You can guarantee your rivals will be doing the same sooner or later.